You'll be £14.99 closer to your next £10.00 credit when you purchase Tynemouth and Wallsend at War 1939–45. What's this? 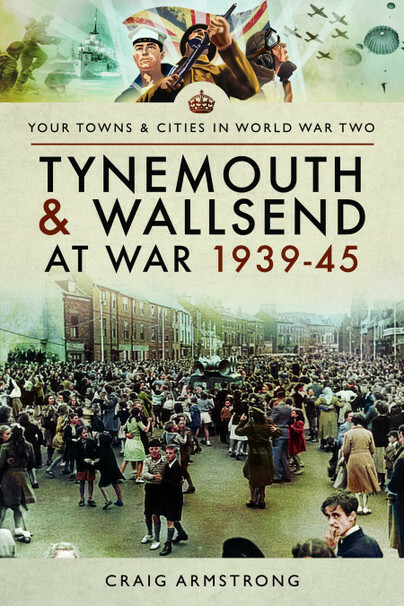 Tynemouth and Wallsend were key communities in the national war effort despite their relatively small size. Located on the key East Coast they played a significant military and civil role in the war. Tynemouth was situated at the key entry to the strategically important River Tyne and was well defended against enemy attack with several forts and other measures in place. The scenic seaside town saw a large military build-up with several different army and naval units rotating through the area to man defences and to train whilst the local Home Guard unit was voted one of the best in the country and was asked to give a radio broadcast on its methods (despite some comic accidents along the way). Wallsend, a largely urban industrial community, was home to key wartime industries with its shipbuilding yards (including Swan Hunters) building and repairing huge numbers of vessels, both naval and merchant, throughout the war. This made the town a significant target for the Luftwaffe and several determined raids were made which inflicted heavy casualties, especially during 1941. The area also hosted a large number of heavy and light industrial works which made significant contributions to the war effort. The fishermen of the North Shields fishing fleet also played a dangerous role during the war (many, including one of the author’s grandfathers served in the Royal Naval Reserve) when supplying fresh fish, already a dangerous task, to a near-starving wartime population was made more dangerous through enemy action. The book also looks at the considerable contribution made by the men and women who volunteered for the ARP and Civil Defence Services. The heavy raids resulted in great loss of life, including the most deadly single attack outside of London when over 100 people were killed when a North Shields shelter took a direct hit in 1941, and the men and women of the emergency services were faced with horrifying scenes (the author’s other grandfather was a regular fireman and ambulanceman who had a particularly lucky escape when his fire engine was blown into a shell crater during a raid) which they had to overcome and work through. A straightforward chronological account of the war as it affected two communities in NE England. Both are shipbuilding towns and were bombed heavily in 1940-41. The material is drawn mostly from local newspapers, an indiscriminate mix of the tragic, the trivial and the banal, reminding us that the small things of life go on alongside the great events.